If you are a traditional barbeque master, nothing will work for you except grilling with charcoal and wood chunks. Fire Magic has the ideal charcoal grill for you. The 24 Series Charcoal Grill with Smoker Oven and Hood comes with adjustable height charcoal pans to allow you complete heat control. Front loading door allows for easy refueling without heat loss. This traditional charcoal grill has been upgraded with Fire Magic’s gourmet touches, including the air-flow charcoal pan which allows for hotter burning coals and more consistent heat. 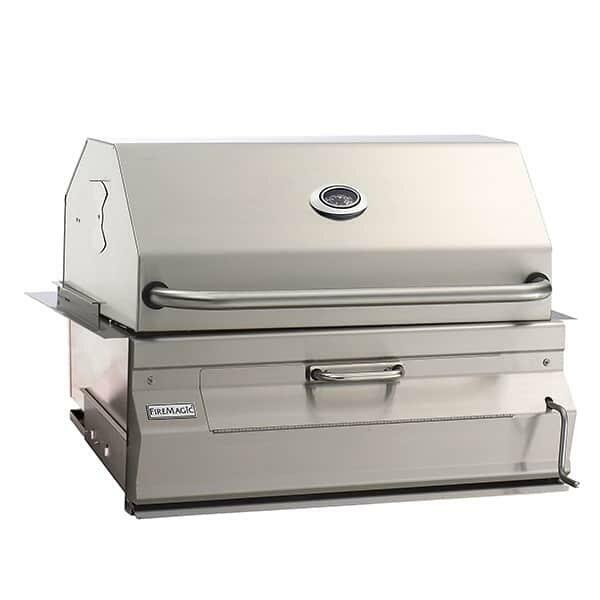 The smoker hood has an adjustable air shutter and this amazing grill comes with an analog thermometer and removable stainless steel warming rack. The 24 Series Charcoal Grill with Smoker Oven and Hood is proudly made by Fire Magic in the USA.